Every newspaper in the world receives anonymous letters that the writer expects to be published, either as a letter to the editor, or as an OP-ED or commentary of some sort. Las Vegas Tribune is no exception to that fact, and if we were to publish every anonymous letter we received, we could have the most spicy hot newspaper around; in fact, just two weeks ago we got a second anonymous letter from the city of Henderson that we are not publishing because the author “forgot” to sign it. We believe that writing a letter and not signing it is a cowardly way of exposing any type of corruption — and even if the writer is concerned about his/her future and safety, there are several ways to avoid being called a coward and do the right thing. For one, measure the ethical and financial consequences, and if the money involved weighs more than the ethics, the writer has a moral problem and that is why Edward Snowden became so popular. Snowden, a young man with a very envious governmental position and a parallel salary, gave up his future and left with all the files that he thought were compromising the safety of the country. If the issue is as drastic as the writer thinks it is, then it could be a matter of picking the right venue and doing a compromise negotiation with the publication by identifying him- or herself and proving that identification, and having the accusations published under “name withheld” instead of under anonymous, which gives the impression that the publication is not aware who the writer is. We happen to believe that the reputation of the New York Times is not the most clean and dignified one in the news business and that the newspaper has become a voice against the administration; that is why the writer chose the New York Times for this dirty trick. 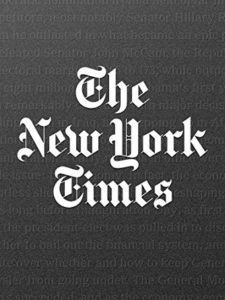 The New York Times is famous for supporting socialist dictators and making them famous, and in many cases destroying otherwise very legit governments in countries even though the newspaper has nothing to gain or benefit from so doing. We believe that the New York Times acted recklessly, unethically, immorally and in an un-American way just to make the duly-elected president, which the newspaper disagrees with, look bad — even if they did not succeed — if in fact that OP-ED is real and not fabricated by the news department of the newspaper. Perhaps the American businesses and corporations that advertise in the New York Times should withdraw those super expensive advertisements until the newspaper does the right thing and makes a decision to identify the anonymous writer, or say that the name has been withheld as the writer requested. Then we have the book that Bob Woodward just wrote that is not as truthful as it should be, perhaps with the idea of getting notoriety to benefit the sales of the book. Isn’t this the same Bob Woodward who interrupted the political train of this country when he and another reporter broke another duly-elected President’s presidential term? We believe that the American audience is becoming too smart for individuals like Bob Woodward to succeed in their evil vindictive attacks on anyone who disagrees with them. The New York Times has always been a center for socialists and defenders of socialist governments (AKA communists) around the world, including the United States of America. Bob Woodward is still living under the false fame of the stigma of the Watergate scandal that he and another rebel political journalist of the Washington Post stumbled onto by accident. We believe that the American people, the American voters, by allowing and supporting newspapers like the New York Times and buying books like the ones Bob Woodward writes — even if it is only out ofcuriosity — are doing a disservice to the nation. We believe that the American voters should realize that the country needs loyal Americans more than ever; we believe that the American people should take a stand and show the enemies of this great nation that they are not going to allow created interests and enemies of the country to take over this nation. American people need to take their country back and show the world that they are Americans above anything and that those attacking the constitutional freedoms and the liberty of this country will no longer be tolerated. The American people need to come forward and destroy the monster that the enemies of the nation have created.